If you’re looking for a high-end betting service that includes a wide range of gambling options, then you should definitely check out Betway. Active since 2006, Betway has grown to become a betting megabrand that today offers everything from casino games and poker rooms to sportsbetting and bingo. We were happy to see that this quantity of action did not come at the cost of quality. Betway’s platform, powered by Microgaming, is extremely smooth. The user interface throughout the site is very easy on the eyes and the service can be accessed via virtually any smartphone or tablet device. Betway Casino is licensed in Malta and has been certified by eCOGRA as a fair and secure online gaming operator. It’s not surprising that it’s become a very popular choice amongst Canadian online casino players. This is also likely due to the fact that it has a simply astounding list of features and its generous welcome bonus of C$1,500 is also an obvious draw. The sheer number of games at Betway is very impressive and because this is Microgaming at its best, quality has not been compromised. Betway offers a wide range of trusted payment options that are available to Canadian players. Betway offers a very attractive bonus to the value of C$1,500. Some players might be put off by the quite steep wagering requirements but this bonus can still be very useful for some, as we explain below. Betway doesn’t have a lot of extras in terms of promotions, but I guess that’s because their core offering is that good. On the other hand, their loyalty program does offer some amazing benefits. Betway has superb customer service with a team on-call 24/7 via telephone, email, and live online chat. 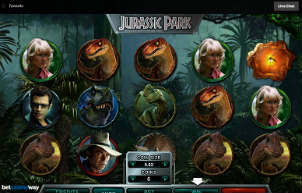 The games on the Betway mobile casino app look great, and using the cashier is straightforward. We loved the integration with the sportsbook, allowing you to make bets from wherever you are. Just the slots at Betway Casino number at over 400. That’s a lot of games. The cool thing is that you really get a nice spread of different slots types from the more traditional but funky 3-reel slots to elaborate video slots with bonus rounds, free spins and other exciting features. The progressive jackpots at Betway Casino are of course part of Microgaming’s massive prize pool. This means that they rise up fast and it’s not rare to have multiple slots games that are not only great to play, but could also boost your bankroll by a seven-figure sum. 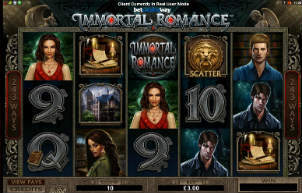 Beyond slots there is a huge variety of table games to be discovered. There’s a fantastic selection of blackjack and roulette variations. Some of these modified games have some very unconventional options, making you rethink your betting strategies, or just have fun and hope that lady luck will smile upon you. 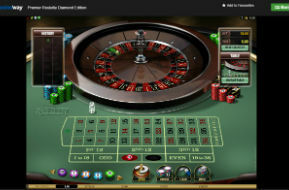 Betway casino also offers roulette, blackjack and baccarat as part of the 3D “Gold Series” of games. These ultra-realistic games really set the mood for some casino action. Betway is considered a leading online sportsbook and once you register, you get access to their impressive portfolio of sports betting markets. A huge range of sports from leagues all over the world can be bet upon and we found that Betway’s odds were very competitive across a variety of bets. As a new bettor from Canada, you will receive a match bonus of up to C$30. There is also a host of useful information on the Betway site about what’s going on in the sports world so you can make informed bets. Finally, we’ll also mention that Betway offers a complete poker room service although when compared with specialized online poker rooms, it falls a bit short in terms of variety. For example, Texas Hold-em and Omaha are of course available, but Stud, Draw, HORSE and others are not. That’s understandable though, and considering that Betway still has cash games, free play, tournaments and sit-n-go tables, it still holds its own with regards to poker. Another great thing about playing poker at Betway is that there are a lot of promotions going on, all the time. The welcome offer is a 200% first deposit match bonus up to C$750. As a new player, you’re eligible to play for up to C$9,000 in freerolls in your first 6 weeks. This can be done easily using credit cards like Mastercard and Visa or with e-wallets and transfer services like Neteller, Skrill, Paypal, ClickandBuy and a host of others. This is also fairly straightforward and you’ll be able to use your transfer method of choice. Note that Mastercard will not let you withdraw from a casino. A quick glance at the list above reveals that if I deposit a total of C$2,750 I will receive the full C$1,500 bonus. That’s a pretty good return on investment. Still, please keep in mind that the bonus is subject to a wagering requirement of 50 times which is a little steep. On the other hand, when you consider that most casinos require both the bonus and the deposit amounts to be wagered, Betway’s offer doesn’t seem too shabby. For players that almost exclusively play slots, this might be a good deal as all your play will contribute to the wagering requirement. This really depends on what level of play you are interested in and what you can afford. A rule of thumb here would be that if the wagering requirements seem too high, just make smaller deposits, and be happy with smaller bonuses. Betway seems to be a very well run establishment and this came through in the casino support staff’s attitude and proficiency. The Betway app is easily downloadable via the Apple App Store or Android market. 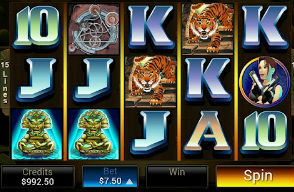 For other smartphone types, the casino can still be accessed via a mobile-friendly browser version. Just visit the Betway site by using your phone’s browser. Besides the amazing Microgaming titles, it’s also really fun being able to use Betway’s great sportsbook with your mobile device. It’s no wonder that Betway has built itself such a big name in the online gaming world. Everything runs really smoothly from registration to installation. We love the huge range of betting options that includes everything from casino games all the way to poker and sportsbetting.